During a break, two kago bearers smoke kiseru pipes while their customer is being served tea by a waitress from a teahouse. The woman’s luggage is tied to the roof of the kago. During the Edo Period, (1603-1868) only samurai were allowed to ride horses, while horse carriages were unknown. The kago therefore was Japan’s main mode of transportation until the invention of the jinrikisha (rickshaw) around 1868. The jinrikisha quickly replaced the kago in the cities (Tokyo for example had already some 56,000 jinrikisha in 18721), but its use continued in mountainous areas where the jinrikisha was often not practical. The kago customer would squat in a semi-recumbent posture. Japanese were used to this, accustomed as they were to sitting on the floor. But to many foreign visitors, the kago was a painful experience about which they often complained in their diaries. See another image of a kago at 1880s • Woman in Kago. 1 March, Roger (2007). 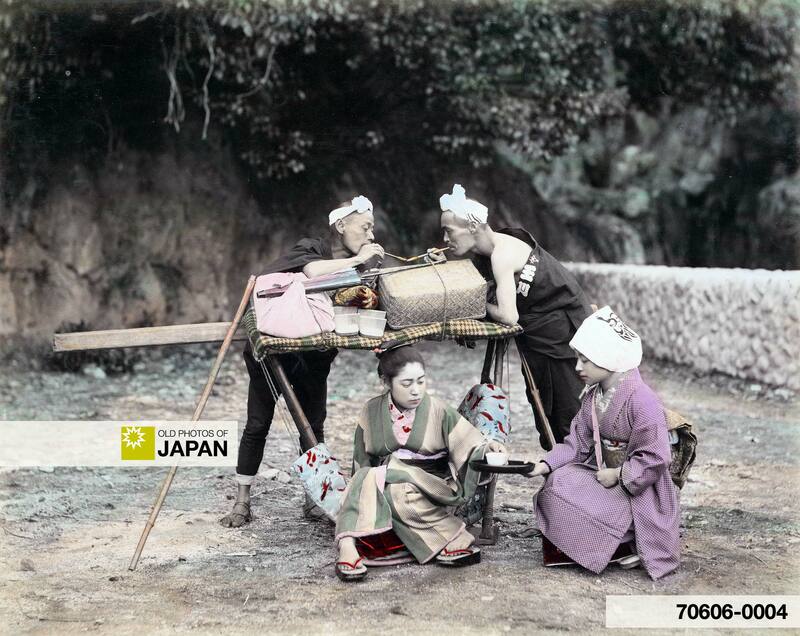 How Japan Solicited the West: The First Hundred Years of Modern Japanese Tourism. University of New South Wales, 2. You can also licence this image online: 70606-0004 @ MeijiShowa.com.